There was a pause and then his father quietly packed away the picnic. Snapping shut the cool-box lid, he stood and looked at his wife. Futh watched the gulls fighting over the remains of their lunch, and then he looked down at his hand and saw the glass vial broken in his palm, the fleshy pad beneath his thumb cut open. The volatile contents of the lighthouse soaked into his wound, stinging, and ran between his fingers, soaking his boots, and the scent of it rose from him like millions of tiny balloons escaping toward the sky. 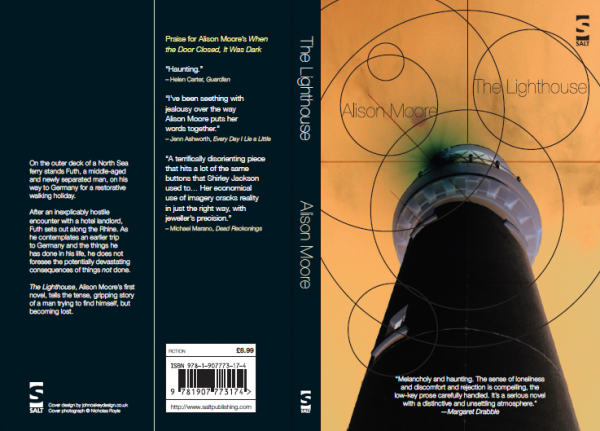 The Lighthouse is one of The Booker shortlist surprise entries, particularly as it is Alison Moore’s first novel. It is certainly very beautifully written, and at times gut-wrenchingly sad. None of the characters, including the protagonist are particularly likeable, yet we do want him to win. Against all the odds, we badly want him to win. This is a novel about the pain of childhood trauma and the power of scent and image to carry memory. Futh is a man now, and on a holiday walking through Germany, something he is ill prepared for just as he has been ill prepared for everything in his life. His wife is leaving him, and he works as a chemist developing scents inspired by trying to recapture the smells of his mother before she abandoned him to his abusive unfaithful father. Futh has chosen rather deliberately to stay ignorant of many of the happenings that have deeply affected his world, almost imagining if things are not conscious then they will not be a problem. Of course they are a problem and Futh develops into a man with such poor grasp of social etiquette that it becomes a severely debilitating handicap in his life. On his holiday Futh’s path cross with another couple at a crises point in their marriage. Ester and Bernard are playing out a weird ritualistic game of mutual emotional abuse, each taunting each others weaknesses bringing their childishness to the surface. On the way to his holiday Futh meets a man on the ferry by the name of Carl who may well end up being the only true friend Futh has ever had. Futh’s strange destiny seems to follow him around. First he is saved from it by his wife, but eventually who we are and where we are headed catches up with us all. Making small talk, he moves up the bar towards her with his naked egg, the white giving between his broad thumb and his short fingers. He stands so close that his foot is touching hers, but she doesn’t move hers away. He bites into his egg and she hears it being wetly masticated inside his mouth. The prose in The Lighthouse is light deceptively posited against the story which is dark. Wrapped up in beautiful writing is the horror story of the way people will ritually abuse each other emotionally for years on end. In the world created by Moore men and women are horrible creatures. So horrible I’ve read his novel can be compared with Steven King and I know what is meant by that comparison. It’s almost a horror story. A piece of genre fiction, without the distraction of blood and gore, but one where you see the terrible end long before it happens and you watch as events conspire to bring about that ending in a relentless, clockwise fashion. You see the ending coming a long way off with this novel, but a desperate hope for it not to be true presses you relentlessly forward. For me, the predictability of the end was a problem, because I found myself less interested once I knew what was coming. The narrative is cushioned and framed in the telling of the characters story but I didn’t feel there was enough drive for me to want to know why the characters were behaving the way they were. So from about half way through, the novel had lost its spark. I continued on of course, because it is beautifully written, but it ended up being more of a study in efficient prose rather than a thrilling book. At 192 pages it’s the shortest book on the list except for Swimming Home, which I found much more complex and interesting. Also, the prose while beautiful when it is working through scent, can be laboured and tiresome as characters describe the way their pastry flakes at crucial moments, and notice the egg on the side of the face without hearing what a person is saying. I’m a little tired of this technique. Its been done to death – particularly in the world of short story telling – hell I’ve done it myself a hundred times! I wanted more from the novel. It needed to be more creatively interesting. One of the aspects I did enjoy greatly with this novel was the focus on scent as a point of reference and memory. Moore can tell a story through its smells very well, so much so that I started to be able to smell the descriptions as I was reading. Violets, cigarette smoke, oranges, and camphor are so strongly evocative within the circular narrative that they w0rmed their way into me bringing the scenes in the book alive when scent was the focus. I was also very impressed with the way Moore uses scent to create an ominous foreboding. I thought that was clever and very interesting. There are a lot of villainous cigarette smokers out there! In the end, while I think The Lighthouse is beautiful and a pleasant read, I can’t say it moved me or inspired me. I do congratulate Alison Moore on a competent debut however. And of course congratulations on being a part of the short list. It goes to show, not everyone had the same problems I did. 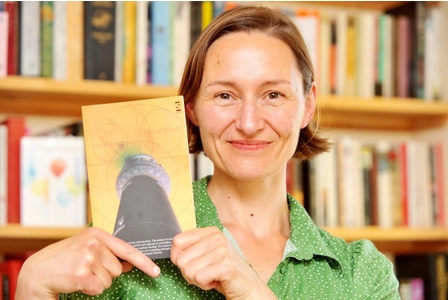 The Lighthouse is published through Salt and available here.